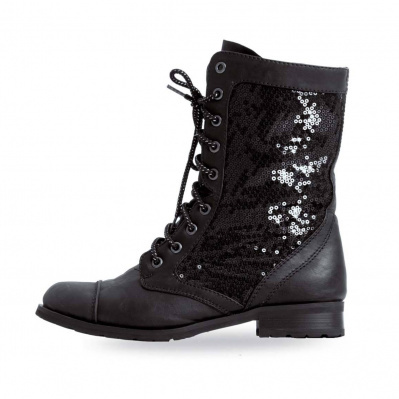 The Gia Maria Sequin Combat Boots feature striking side sequin panels that will help you sparkle on stage. They are constructed with a non-marking flexible sole, side zipper for easy on and off, and toe guard to prevent chaffing. Can also be worn as an everyday shoe to add style to any outfit! Adult sizes run same as street shoe. Child sizes run 1-2 sizes smaller than street shoe.